A carton is one of those everyday items you might take for granted, or perhaps you have asked yourself as you push your shopping cart past aisle after aisle of products on the shelves. It is a standard sheet of corrugated board is made from three components; a sheet of corrugated fluted paper sandwiched between an outside liner. A standard sheet of corrugated board is made from three components; a sheet of corrugated fluted paper sandwiched between an outside liner. Each side of the fluting (medium) is glued to a sheet of flat liner paper. This gluing fixes or anchors the flutes to the linear boards with adhesive, it resists bending and pressure from all directions thus capable of supporting a considerable amount of weights and also gives the lightweight paper especially high stability. Albert L. Jones is the father of corrugated board. Born in America, Jones discovered the idea while manufacturing neck ruffs and frills on a pleating machine. Instead of using fabric he put paper through the milling cylinders to produce an elastic packaging material. In December 1871 he was granted a patent. In 1874 Oliver Long achieved a considerable improvement by gluing a fluted sheet of corrugating medium onto a linerboard, thus creating single face corrugated board. 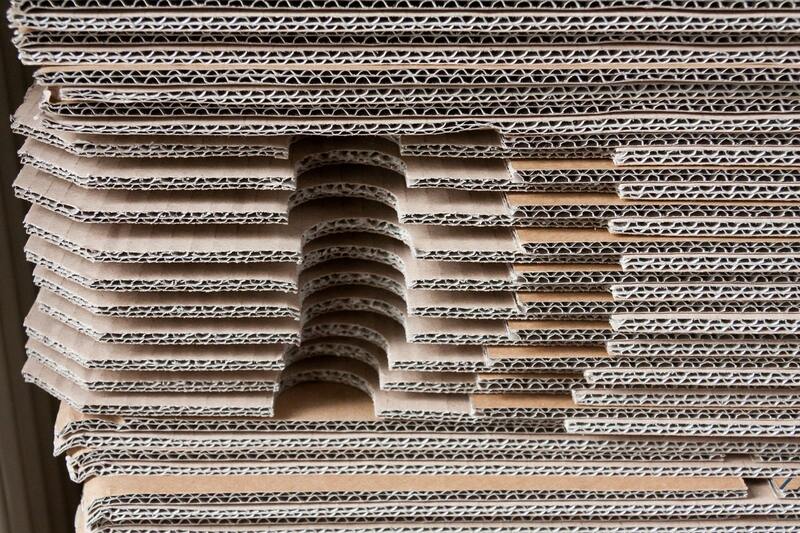 The first attempts to make corrugated board in Europe were started in 1883, in London. This was followed three years later, in 1886, by the first corrugated board factory on the continent at Kirchberg in Germany. Basic material for the production of corrugated board is the paper-board. There are two main type of paperboard. There are two main types of paperboard: Kraft and Test. Kraft Paper: Comes from softwood trees – the strongest form of paper and the best to print on this is the most common outside liner for corrugated boxes. Test Paper: This is so-called double layer paperboard (duplex paper). Most standard cartons use recycled paper for the fluting and the inside liner. Each sheet of liner paper is commonly composed of two layers. The finer cover layer is ideal for printing and aesthetics, and the basic layer is excellent for adhesion strength. Combining all of the above, it is possible to specify a simple short description that defines the board grade of a box. For example 125K/B/125T. This means a corrugated box, made from 125gsm Kraft outer liner, B fluting, and 125gsm Test inner lining. Also called shipping boxes, RSCs are the most commonly used boxes. They are usually Kraft brown in color, have four flaps on the top and bottom and the side walls are sealed at one corner known as the “Manufacturer’s Joint”. This design is highly functional for most packing applications. A two-piece box with a separate lid that that fits over a bottom tray. For telescope type boxes the height (h) of the upper part (lid) should be given as a fourth measurement after an oblique stroke i.e. The “Manufacturer’s Joint” is where the two ends of the side panels meet to form the box. At the point, the panels are fastened together with tape, staples or glue. The side panel thickness and content weight determine the type of seal used for the manufacturer’s joint. For example, glue is used for the most single was boxes, but staples are found in some double was and in most triple wall boxes. This code which is prepared in collaboration with ESBO (The European Solid Board Organization) contains a methodical presentation of all existing box design styles, a code number being assigned to each design. As a reference document, the code is used worldwide and it has been adopted by the United Nations. A way to be sure that the material of the box that you’re purchasing meets industry standards is to look for the Manufacture’s Certification Stamp, usually printed on one of the bottom flaps of the box. The stamp identifies the material as “single wall”, “double wall” or “triple wall”. It also certifies the Mullen Bursting Test (most common in 200 lbs. per square inch) or the Edge Crush Test (ECT 32 lbs. per inch). The Mullen Test measures the bursting strength of the corrugated linerboard while the Edge Crust Test measures linerboard stacking strength. All dimensions are expressed as internal dimensions and can be specified in mm, cm, or inches depending on buyer’s specs. Carton markings are printed in clear black lettering and must be in accordance with the given layout. The contents of each export carton must be clearly indicated that the front end and at the back end. Generally, the info contains info like Shipper’s Address and Consignee Address, PO No. Style No., size/s, dept no., Color, carton Number, Total quantity, Factory ID, SKU No., Gross weight, Net weight, Country of Origin, Cartons must be properly marked for MIXED quantity, ODD Packing, Lot No. and packing list. The corrugated board has five common sizes of fluting, ‘A’,’B’,’C’,’E’ and ‘F’. The letter designation refers to the order they were invented, not their relative size.